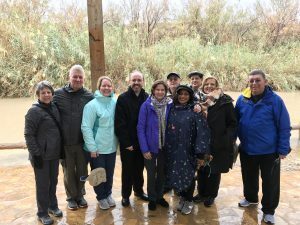 Today the Jordan group left them on and we drove down to the Jordan River and had Mass on the shores of the river where Jesus was baptized. You can watch/listen to the homily and watch the renewal of baptisms here. We then drove along the Jordan River north and crossed over into Israel and around the Sea of Galilee to our hotel in Tiberias. The second group, coming from the United States today, arrived early at the airport and we picked them up and brought them up to Tiberias in time for dinner and Mass along the shore of Galilee. Enjoy the movie for each group below. Bible Riddle: What Am I? Since we will be here today, I thought this riddle appropriate! Write to me if you need help; click here to see the answer. doing what God had decided. that led me to obey God’s rule. and the limit of many kings. Once God’s son I did embrace. Once the ark stood in my place. nor in the heavens was I found.